Model PC160LC-7 features 110 hp Turbocharged SAA4D102E-2 engine and 74 gal fuel tank. Equipment Managing Monitoring System monitors critical fluid levels and components. Active Mode provides maximum power, Economy Mode reduces fuel consumption by 25%, Lifting Mode increases hydraulic pressure by 7%, and Breaker Mode provides optimum engine rpm and hydraulic flow. 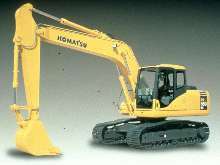 Excavator is capable of lifting 3.14 tons 15 ft high and reaching 20 ft.
Vernon Hills, Ill. - May 5, 2003 - Komatsu America Corp. introduces the PC160LC-7 hydraulic excavator. A replacement for the PC150LC-6, this technologically advanced model improves on productivity and stability while reducing weight to improve the machine's ease of transport. Designed for use in construction, utility/public works, aggregates and waste/recycling applications, the PC160LC-7 reduces operating cost through extended service intervals and increased production. Komatsu offers an Equipment Management Monitoring System (EMMS) that monitors critical fluid levels and components. This system notifies the operator immediately of abnormalities in the machine's operation and allows for preventative maintenance to be performed prior to a costly failure. Lubrication intervals have been extended from 100 hours to 500 and the fuel tank has expanded to 74 U.S. gallons from 66. Essentially, the machine spends more time digging than being serviced. Komatsu's turbocharged SAA4D102E-2 engine provides 110HP and complies with EPA, EU and Japan Tier 2 standards without sacrificing power and productivity. Combined with 10 gallons per minute additional hydraulic flow and increased system pressure, the PC160LC-7 has the hydraulic power required of it when needed. It outperforms its peers through a 29 percent increase in digging power and four working modes that allow the operator to tailor the machine's output to a given application. Active Mode provides maximum power and production for applications requiring fast cycle times. Economy Mode reduces fuel consumption by 25 percent while increasing production by nine percent compared to similar settings on the PC150LC-6. Lifting Mode increases hydraulic pressure by seven percent, and Breaker Mode provides optimum engine rpm and hydraulic flow to match attachment requirements. The PC160LC-7's lateral stability also has been improved, making it capable of lifting a 3.14 U.S. ton object 15 ft. high and reaching 20 ft., and maximum drawbar pull has been increased by five percent over the PC150LC-6, providing improved slope climbing performance. Cab space is increased by 14 percent over its predecessor, offering an exceptionally comfortable operating environment. The pressurized cab and air filter allow for the air conditioner to run while keeping external dust and dirt out, and a new mounting system reduces the amount of vibration affecting the operator. Noise levels are reduced through the tightly sealed cab design and, thanks to the larger cab, the operating seat is capable of full, flat reclining. The seat and controllers operate on a double-slide mechanism that allows them to be adjusted together or independently of each other, assisting in maximum operator productivity and comfort. Komatsu America Corp. (KAC) is the second-largest manufacturer and supplier of construction, mining and utility equipment and parts and services in North America. Visit Komatsu America's website at www.komatsuamerica.com.